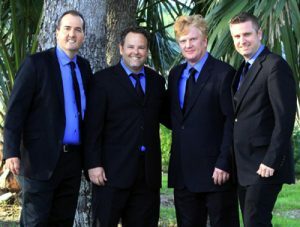 St. Catherine's sixth annual concert series begins their season with The Charlestones, four men from Charleston, South Carolina– the premier a cappella quartet in the Low Country. Formed in 2014 and having found each other within the congregation of St. John's Lutheran Church, Charleston, you might think that The Charlestones came together through divine intervention. The group, Todd Monsell (bass), Brink Norton (tenor), William Purcell and Stephen Spaulding (baritones), sings music across multiple genres, all unplugged and without accompaniment. Check out their videos on Facebook at charlestonesquartet. All concerts in the series are free, with an offering taken, and everyone is invited to a small reception after the concert to meet and greet the artists. No tickets are required.